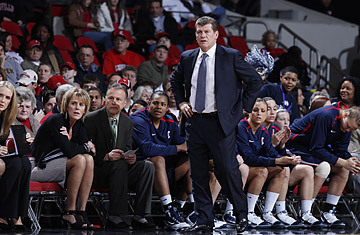 Geno Auriemma, head coach to the University of Connecticut women's basketball team. On Dec. 19, the University of Connecticut's women's basketball team, coached by Hall of Famer Geno Auriemma, will match up against Ohio State in the Maggie Dixon Classic in New York City. A win would give UConn its 88th straight victory, a record mark that would tie the venerated streak that John Wooden's UCLA teams put together in the early 1970s. They could then break UCLA's streak with a win Dec. 21, against Florida State. In late November, Auriemma sat with TIME for several lengthy, colorful conversations about a range of issues, including how UConn's streak should be viewed by sports fans, how coaching young women has changed over the decades, and why he doesn't coddle his players. Do you think your streak will be as revered as the UCLA streak? No. But it shouldn't be that I'm eclipsing John Wooden. It shouldn't be Geno Auriemma, and the University of Connecticut, owns the longest winning streak in the history of basketball. No. It's men's basketball, and women's basketball. But we've accomplished something that most people can only dream of accomplishing. Everything should be celebrated equally. So you have the male chauvinist guys going, 'How dare they compare what they're doing to what the men did. Then you've got the women's side going, 'well, it should be celebrated, because if the women beat the men's record, it's our record.' Maybe the men feel threatened and the women are insecure. I don't know if one has to be at the expense of the other. There's some sexism to it, and why is it acceptable? Are you downplaying what we've done because it's just a bunch of women's basketball players doing it against women's competition? That's a sexist opinion. But again, we're not here to carry the banner. We're just trying to win basketball games. We're not here to slay the dragon of UCLA. I made a lot of money betting against my friends about UCLA winning those championships. So I'm the last guy who is going downplay UCLA winning. Every freaking year. You're in high school  'yo, I bet you 10 bucks UCLA wins the national championship.' Come on! That was the easiest money you could ever win. What are some of the biggest challenges that come with coaching women's basketball? One of the hardest things is that they have no frame of reference. They don't play enough. I challenge you to find 8, 9, 10 girls in a playground, just playing basketball. That stuff doesn't exist. You have to teach them everything. I'd say 99.9% of the women's game is played below the rim. Footwork and positioning and all that stuff is so crucial, because you can't just throw the ball up on the rim. It makes coaching a little more challenging, but in a sense more rewarding, because they have they sort of learned everything from you and your staff. That's a good feeling. What's different about coaching women's basketball now, as opposed to when you first got the UConn job in 1985? The attention span is that big [holds fingers together]. Kids today, they don't interact with people as much. So their ability to communicate, connect, for extended periods of time, isn't as great. They spend so much time with their things [fake types on fake Blackberry] that they communicate that way. And then if you want to put it in your pocket and walk away, you put it in your pocket and walk away. So my guess is there's not enough interaction with other human beings, where you can kind of follow things. How often do you think they do that during the course of a day? Listen for five minutes? Or I'll say, 'I want you to talk, and I'll listen. What have you got to say?' 'Meh meh meh meh meh.' But then you check their whatever the hell it is, and they've written things that long [hands wide]. 'You tell me what's going on? Meh meh meh meh meh.' 'Can you speak up please? Meh meh meh meh meh.' Are you s---ing me? On the court, their expectations of themselves are higher. There's a much better sense of 'I want to be really good.' They are much better physically, they've played more basketball, and there are more opportunities for them to play at a younger age, against better competition. It's all organized obviously, but this idea of 'I can get a college scholarship, I might be able to be a pro someday,' all those things didn't exist 25 years ago. They have made kids train harder, compete harder, and push themselves harder while they are in high school. We haven't had to compromise. There's not one kid, on our team now, that's been in our program, that came here with any promises of, 'if you come here, we're going to give you this, this, this, and this and you're going to get that, that, and that. That's never happened here, and it never will happen. I mean, there's no point in trying to convince kids to come here. Kids either already know that, or they're never going to know. And if they don't think this is the best place for them, why do I want them? They're not smart enough to come here. I just say, 'I think you can play for us, I think you can be a really good player. But don't ask me how many minutes you are gong to play, don't ask me what position you're going to play, don't ask me what my role is. You know, you come, you go to practice, and after about a month or two in practice, you'll tell me what your role is. I'll tell you another thing. There are more kids who want guarantees. Where as you go back, you know, you're recruiting kids, they are so over the top because you are offering a scholarship, so grateful, so appreciative. Now it's like, all right, what can you do for me?